[206 Pages Report] The automotive smart display market is estimated to be USD 5.37 billion in 2017 and is projected to grow at a CAGR of 12.77% during the forecast period. The automotive smart display market applications is primarily driven by the shifting inclination towards demand for connected vehicles which is the key enabler of autonomous vehicles. 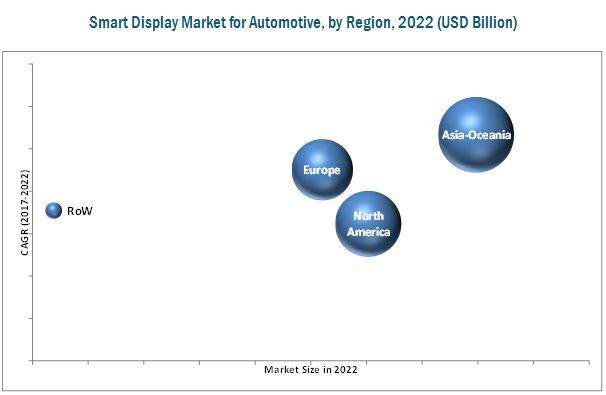 Additionally, the increase in adoption of display applications by OEMs in automotive hubs such as U.S. and China and the growing demand for large sized displays such as seen in the Tesla Model S will drive the demand for the automotive smart display market applications. The base year for the report is 2016 and the forecast year is 2022. With advancement of technology, the automotive display applications have witnessed rapid evolution during the last decade. Growing in-vehicle safety and comfort functions have contributed to the growth of automotive display applications that are now offered by OEMs. In many countries, government regulations such as mandatory in-vehicle GPS systems for commercial vehicles and mandatory rear view sensors and back up cameras in passenger cars are expected to increase the market for advanced center stack touchscreen displays in vehicles. In case of commercial vehicles, display applications are used for navigation purpose and telematics. The market for center stack touchscreen displays will continue to grow at a steady pace, given their increasing use in premium light duty vehicles and heavy duty vehicles. The market would also be driven by the increase in consumer demand for center stack touchscreen displays in economic passenger cars in cost sensitive automotive markets of China, Brazil, India, and Russia. The research methodology used in the automotive smart display market study involves primary and secondary sources and follows bottom-up and top-down approaches for the purpose of data triangulation. The study involves country-level OEM and model-wise analysis of the smart display applications for automotive. This analysis involves historical trends as well as existing penetrations by country as well as vehicle type. The analysis is projected based on various factors such as growth trends in vehicle production and regulations or mandates on implementation of automotive electronics that drive the display application market, among others. The analysis has been discussed and validated by primary respondents, which include experts from the automotive smart display market industry, manufacturers, and suppliers. Secondary sources include associations such as International Organization of Motor Vehicle Manufacturers (OICA), American Association of Motor Vehicle Administrators (AAMVA), Automotive Component Manufacturers Association of India (ACMA), and paid databases and directories such as Factiva and Bloomberg. 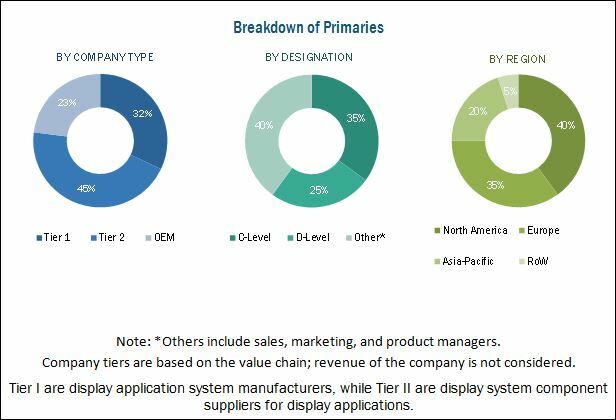 The smart display for automotive market comprises a network of players involved in the research and product development; raw material supply; component manufacturing; distribution and sale; and post-sales services. Key players in the market include Robert Bosch GmbH (Germany), Panasonic Corporation (Japan), Continental AG (Germany), Denso Corporation (Japan), Magna International Inc. (Canada), LG Display Co. Ltd. (Korea), Valeo SA (France), Delphi Automotive PLC (U.K.), Kyocera Corporation (Japan), Yazaki Corporation (Japan), AU Optronics (Taiwan), Japan Display Inc. (Japan), Pioneer Corporation (Japan) and Alpine Electronics Inc. (Japan). In January 2017, Bosch developed a new dual-view infotainment display, which shows two separate programs for the driver and the front-seat passenger at the same time. The display offers outstanding image quality and twice the functional capabilities as compared to traditional single-view displays while taking up no additional space. In November 2016, Panasonic Corporation developed a new liquid crystal panel that can achieve a contrast ratio of over 1,000,000:1. The improved contrast ratio is 600 times that of conventional liquid crystal panels. The new liquid crystal panel will display dark objects darker and bright objects brighter. In August 2016, Continental AG developed a 4.2-inch TFT cluster for the Borgward BX7 through a supply collaboration with Borgward. The cluster offers a high resolution (480x727) and high contrast ratios in a super-wide angle of view. What are new application areas which the smart displays for automotive companies are exploring? The automotive smart display market is projected to grow at a CAGR of 12.77% from 2017 to 2022, to reach a market size of USD 9.80 Billion by 2022. The key drivers for the market are the increasing adoption of automotive displays inside vehicles, rising consumer demand for enhanced user experience and convenience features, growing demand for connected vehicles, and integration of smartphones with vehicles. The center stack touchscreen display application is estimated to be the largest growing segment for the smart display market by automotive application, in terms of volume and value. The growth of this application can be attributed to the growth in suppliers’ revenue from the increasing consumer demand for in-vehicle center stack displays. Center stack display applications are growing in demand due to the availability of larger sized displays, enhanced touch capabilities and better functional capabilities. Key system suppliers are expanding their presence in the automotive smart display market applications by winning supply contracts with major OEMS. Center stack touchscreen displays have been developed to incorporate various functions such as cabin temperature controls and gesture controls. Center stack touchscreen displays in a connected car also provide real time traffic updates and availability of parking spaces. They also help to check mail, schedule appointments, and make payments. Center stack display applications dominate the light duty vehicles segment of the automotive smart display market. However, with safety and convenience functions and telematics now being featured in commercial vehicles, fleet owners are increasingly demanding center stack displays for commercial vehicles. Center stack displays in commercial vehicles are used for navigation purpose. The 6”-10” display size is estimated to be the largest segment of the automotive smart display market applications. OEMs are expanding the size of in-vehicle displays as consumers demand larger display applications in vehicles and digital and virtual automotive functions are developed further. Tesla Motor’s 17-inch capacitive touchscreen center stack display integrates climate control, sunroof control, suspension settings, and advanced navigation with real time updates, connected car features, smartphone sync, and multimedia into a single touchscreen platform. Many more OEMs are now offering large displays in a car to set a differentiating standard for multimedia and telematics functions. The demand for large displays is expected to increase as OEMs offer customizable functions. Audi’s 12.3-inch display combines all display functions into one platform with 3-D graphics and a customization capability. Asia-Oceania is estimated to dominate the automotive smart display market during the forecast period. The region has emerged as a major automotive hub in recent years with the majority of the market share of vehicle production and vehicle sales. The demand for smart display market automotive applications is directly linked to the vehicle production in this region. With the shift of automobile manufacturing plants to developing countries and the region being home to many key companies involved in manufacturing automotive displays, Asia-Oceania is estimated to dominate the automotive smart display market display applications market during the forecast period. A key factor restraining the growth of the automotive smart display market is the high cost of developing display systems and related technologies. Advanced automotive display applications involve complex interlinking of electronic and mechanical components. With advancement in development of semi-autonomous and electric vehicles, automotive display applications will play a key role in automotive cockpit electronics. Due to this, companies have to invest heavily in research and development for developing and testing prototypes of advanced display applications technologies. The high costs involved are restraining the development of the automotive display applications. The automotive smart display market is dominated by a few global players and comprises several regional players. Some of the key manufacturers operating in the market are Continental AG (Germany), Robert Bosch GmbH (Germany), Panasonic Corporation (Japan), and Visteon Corporation (U.S.). *Top 21 Companies Analyzed for This Study are – Robert Bosch GmbH, Panasonic Corporation, Continental Ag, Denso Corporation, Magna International Inc., LG Display Co, Ltd., Valeo S.A., Delphi Automotive PLC, Kyocera Corporation, Yazaki Corporation, AU Optronics Corporation, Japan Display Inc., Pioneer Corporation, Visteon Corporation, Alpine Electronics, Nippon Seiki Co, Ltd., Gentex Corporation, Garmin Ltd, Fujitsu Ten, Innolux Corporation, Ficosa International S.A.
12.16 Nippon Seiki Co. Ltd.